As promised, here is my wonderful chestnut dessert. 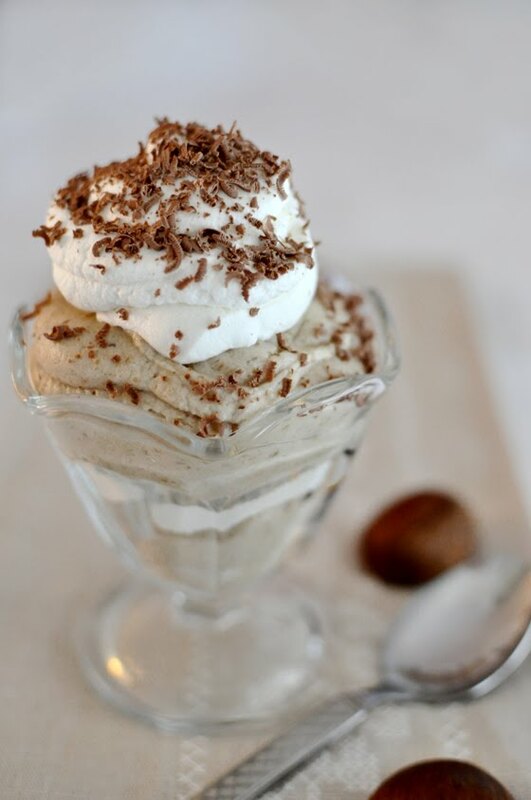 A chestnut parfait. This might be my favorite way ever of eating chestnuts. Beautiful puree, whipped cream and a bit of chocolate. Yum! I fully intend to try out some Croatian recipes I found with chestnuts, so we will see if it's going to get some competition, but for now, I am really enjoying this. And once you have chestnuts boiled and cleaned, it's a breeze! I don't really have an exact recipe for this, just some general directions. Cut your chestnuts on belly side in one long line. Make sure to use a sharp knife and to cut through both the outer shell and inner skin. When cooking them it doesn't really hurt if you cut into the chestnut itself, like it does when you are roasting them, so this makes it a bit easier. Cook them in a pot of boiling water for about hour and a half, then drain the water out and cover the pot with a dish towel. I find it easiest to clean them while still warm. Half each chestnut and then carve it with a small spoon to get all the meat out, being careful not to scrape into the skin, it is tough and yucky. If some chestnuts have black spots, discard those. Once you have them all cleaned, puree them well in food processor and first you can add just a bit of water to get it going and then, if it needs more liquid, add little bit of heavy cream. This just helps it blend, you do not want to put too much heavy whipping cream right away, we will do that later with the portion of puree we want to use for parfait. At this point I usually freeze anything I'm not going to use within a few days. Now, for the parfait itself I just take a little bit of my pureed chestnuts and mix it with heavy whipping cream, sugar and rum extract. I don't like it too sweet, I recommend adding a bit at the time until you get it just perfect. End result should be nice, creamy and light, just slightly sweet. I also prepare whipped cream and some melted chocolate or I just grate it. Depending what you like, you can either spoon some puree in a cup or a bowl, or put it all in a zip-lock baggie, cut the corner from it and make it fancier by piping it into your serving cup or bowl. Then grate some chocolate on top (or add a spoon of melted chocolate) and spoon or pipe on some whipped cream. 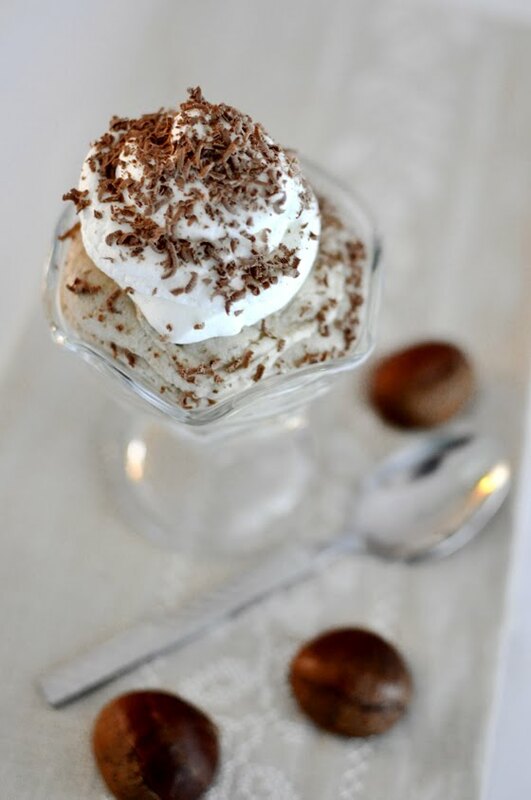 Repeat however many times you like and finish with whipped cream on top and some grated chocolate. 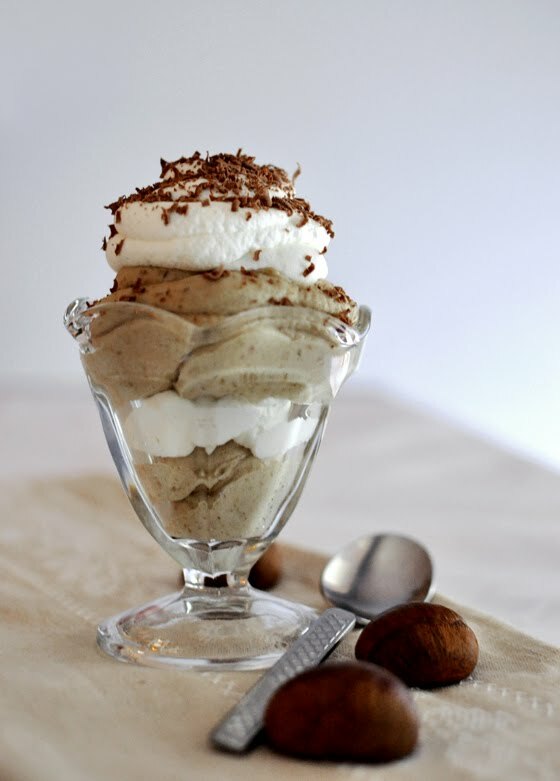 This is really a beautiful dessert, I hope you try it!